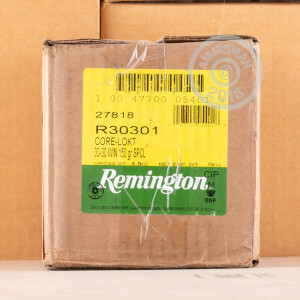 This 30-30 ammunition from Remington uses the time-tested Core-Lokt bullet, which (as its name suggests) features a mechanically locked jacket and core for maximum weight retention. 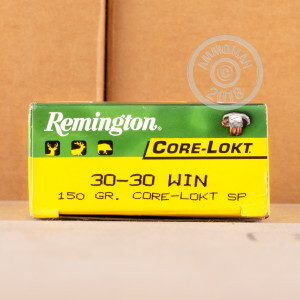 Each cartridge in this box of 20 fires a 150 grain soft point Core-Lokt at 2,390 feet per second and delivers good medium-range performance against deer, coyotes, and other midsize game. Core-Lokt ammo is manufactured in Lonoke, Arkansas using non-corrosive Boxer primers and brass cases. 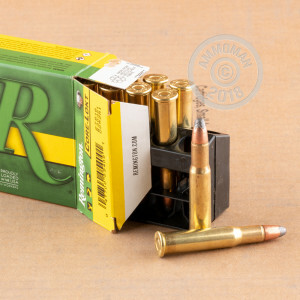 Buy $99 or more in ammo from AmmoMan.com to qualify for free shipping!